Adding images to a blog post is absolutely essential. Not only does it add life and imagery to the text of your post, but it gives your reader something tangible through which to understand your idea, pontification, or reflection. Multiple images, however, can prove problemmatic as too many individual attachments can make your post appear as if it goes on forever. 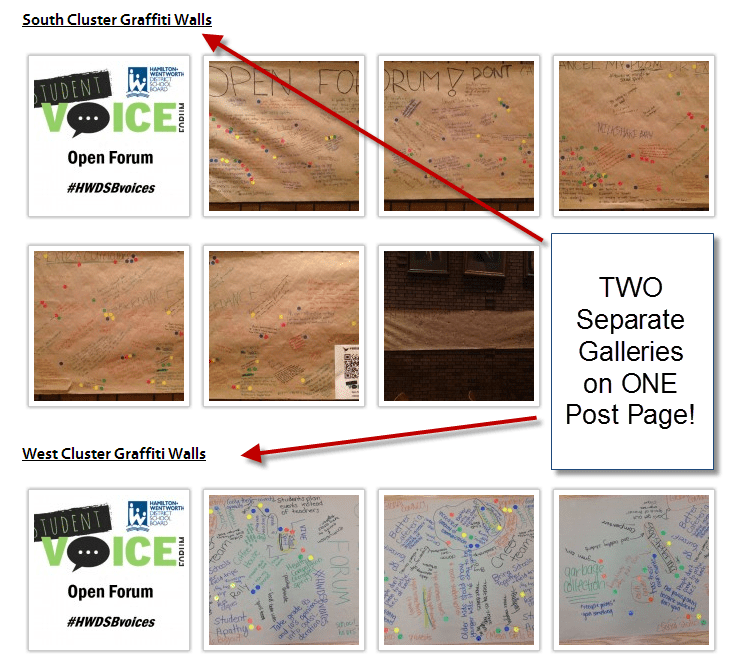 One way around this is to add galleries to your WordPress blog post. This in itself can prove challenging as the native WordPress Gallery function only allows one gallery per post using the default shortcode. One of the first reactions of wanting to add multiple galleries to a post or page in WordPress is to look for a plugin (i.e. NextGEN Gallery) – which I love by the way! One thing @mrjarbenne and I can attest to is “the lesser plugins the better”. Too many plugins can break a site and there is nothing more frustrating (or time consuming) than trying to determine which plugin did the site in. 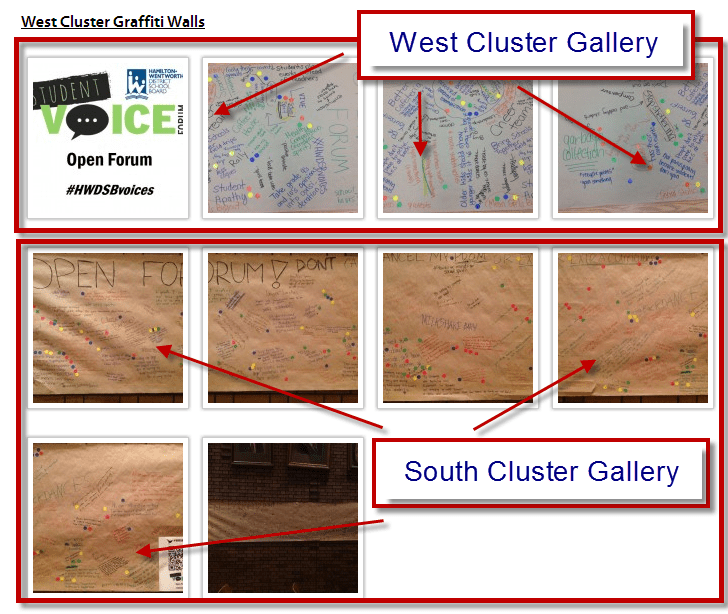 Over the past couple of days, I have been adding the Graffiti Wall images to this years Director’s Student Voice Forum blog. Last year, I created a new post for every wall for every topic. This was time consuming yet beneficial in that I could tag each individual wall separately, which added to the depth and power of the embedded tag cloud in the right navigation area. This year I wanted something different. This year my vision has been to include all voices (apart from the Twitter Stream) on one post – the post in which the question for discussion was posed. The Voicethread audio, video & text comments, the written WordPress comments, and the written Graffiti Wall comments could all be included in one place on one post per topic. This will make it much easier for everybody to consume the #studentvoices of @HWDSB and much easier for us to analyze the data in the days moving forward. Back to the problem, though. The native @Wordpress gallery only allows one gallery per post or page. Via Post/Page ID: Create a new Post or Page and upload the images you want there. If a Post, backdate it so that it does not appear at the front of your site. If a Page, and your theme supports it, make it a child Page of an already published Page. After Publishing the Post or Page go to your Dashboard’s Manage>>Posts or Manage>Pages and then hold your mouse over the title of the Post where you inserted the additional Gallery. In your browser’s status bar, you will see a link to edit your Post, which ends in a number. That is the ID number for the Post or Page where the additional Gallery appears and what needs to be inserted in the Gallery shortcode via the HTML/Text Editor. When I first embedded the gallery after adding all of the media files every image was added to ONE gallery. I use Google Chrome as my Internet browser. 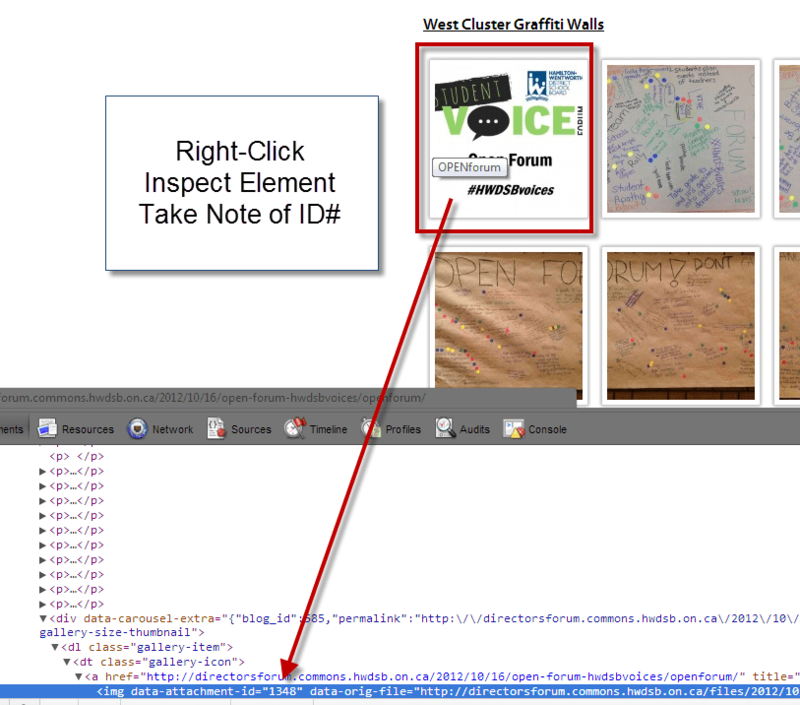 It has a neat little feature that has saved me numerous times when it comes to website design: “Inspect Element”. To inspect any element on the web using this feature, right-click any image or asset on a page. In this case, I’m looking for the image ID. Right-Click + Inspect every image and write down their attachment ID #s.
Duplicate and tweak the code as many times as you wish to add as many galleries you wish and VOILA! Multiple galleries on one post or page! Wow Aaron! I didn’t realize this at all. This is such a beneficial function. To be honest, I didn’t even know you could add one gallery to a site. Usually I just create slideshows to embed, but sometimes those can be hard to put together well. This is definitely something I need to try. Thanks for finally talking about >Adding Multiple Galleries to WordPress #whatilearnedtoday <Loved it!